Each individual deposit made with Zodiac Casino is considered a single deposit for the purpose of this promotion. 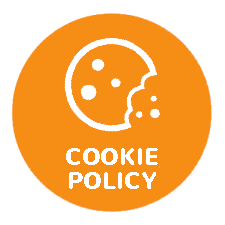 The total of successive deposits cannot fulfil the sign up bonus requirements – each deposit is only considered individually. Therefore the first five (5) individual deposits ONLY will determine the bonus amounts allocated for the purpose of this promotion. 80 chances to win the jackpot will be awarded on first deposit as a £20 bonus to the casino account, which may be used to place 80 £0.25 bets on the progressive jackpot slot games. The minimum first deposit is £1, for all subsequent deposits the minimum deposit is £10. The first deposit bonus is subject to 60 times play-through before your bonus balance is converted to cash. Once bonus funds have been converted to cash, these funds may be withdrawn. The Player acknowledges that in order to be eligible for any promotion or bonus, they must be playing with the primary currency used in the country where they have a registered address from where they are playing. Zodiac Casino reserves the right to withhold bonuses resulting from deposits in any currency made in contradiction to this condition. An exception to this clause is made for USD and CAD. Pending withdrawal time 48 hours Withdrawals are between 1 and 10 working days depending on method used. Zodiac Casino is part of the Rewards group, which is also responsible for Captain Cook’s Casino. It won’t take you long to notice the similarities between the two sites either. Both are download only (or mobile) sites for one. They have a very similar interface for another, including a retro (or ‘dated’ depending on your spin) login page that looks like it’s been beamed in from MS DOS, circa 1995. Perhaps most importantly, however, they also share a very similar welcome bonus. That’s pretty crucial because you won’t find bonuses like this outside of the Rewards Group. It’s what my old sports teacher used to call ‘a humdinger’, but you’ll need to read on to find out more. The visual similarities between Zodiac Casino and Captain Cook’s are stark. Punch the URL in for either and you’re transported to a promotional homepage featuring various happy (is it unfair to say smug?) souls holding the sort of giant cheques that are only ever handed over to charities or gamblers. The slightly cheesy promos serve a purpose of course. They reflect the Zodiac Casino’s marketing strategy, or at least the one used to publicise their welcome bonus. It’s advertised as ’80 chances to win the jackpot’ for a £1 stake’. The reality is perhaps not quite so black and white, but more on that later. The overall impression we get from the site is that it all errs a little on the side of kitsch but in a way, it’s pleasingly low rent. It’s something a little different to the bright, cartoon graphics you find elsewhere. It’s earthy. Well, it’s not as easy to use as a casino that loads from the browser, is it? At least not initially anyway. But once it’s downloaded to your desktop, you can just double-click on it to open it up. You’re prompted to register the first time as soon as the download finishes, and we found that process nice and easy. Indeed, you only have to fill in a one-page sign up form to get going. That said the first time the casino opens, it takes an age to load. We were relieved on our subsequent Zodiac Casino login ran much quicker, so we don’t have too many complaints. Now, we may have missed something during registration here but we were also assigned a nonsensical account holder ‘username’ of the sort you would never have a hope in hell of remembering. The same thing happened when we signed up for Captain Cook’s Casino too, but luckily both sites auto-populate the information so you don’t need to remember it every time. Zodiac Casino lists MicroGaming games exclusively, so if you’re a NetEnt or Play N’ Go fan then look elsewhere. However, there are enough MicroGaming fans out there to support plenty of online casinos of this type. As you’d expect, such a narrow provider focus allows Zodiac to go to town with their sole provider, and stock virtually every game it’s ever produced. This includes nearly 400 video slots, tens of jackpot games and scores of table/card game varieties such as blackjack, poker and roulette. That adds plenty of variety, but those of you who follow the fortunes of MicroGaming will be acutely aware that the company’s core focus is on the provision of the very best slots in the business. That’s why we love them so much at 777 Casino, because slots are our priority too. So here we go then. It’s time to discuss the Zodiac Casino 80 free spins welcome bonus. As is typically the case with any casino in the Rewards group, it’s their introductory offer that steals many of the headlines. From our communication with our readers, we know that they love the Captain Cook’s Casino welcome bonus, which is billed as ‘100 chances to win the jackpot for a £5 deposit’. Now, Zodiac Casino is similar but different. With them, you ‘only’ get 80 chances to win the jackpot, but there’s a trade-off. You only have to deposit a measly £1 or €1 to get it! We’ve never found a welcome bonus that sets the minimum deposit level so low, ever. Let alone one that gives so much in return. Now, we should say this. The offer is a bit of triumph of marketing. You absolutely get 80 chances to win the jackpot, but the deposit bonus is actually much more versatile than that. It’s actually credited as £20 bonus cash. 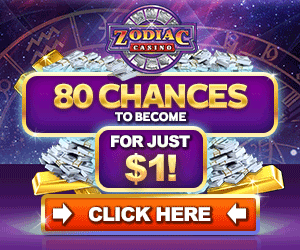 Questions have been asked about this offer and more generally is Zodiac Casino fake? Well, we can tell you, that it is 100% not! It’s the real deal. Zodiac casino, like all good online gambling sites, accepts all major deposit and withdrawal payment methods. This includes bank transfers, Skrill, Visa, Mastercard, paysafecard, Neteller, instadebit, PayPal and bizarrely enough Diners Club. Does any actually own a Diners Club card any more? Unlike other casinos Zodiac does not discriminate on your payment method; you will still receive the casino bonus and rewards program benefits even using Neteller and Skrill. An important side note is that you can only withdraw any real money winnings using the same deposit payment method and use the same account name. The terms and conditions section on the Zodiac website explain these details in more detail. If in doubt, contact the customer support team using live chat. WHY BECOME A REGULAR PLAYER AT ZODIAC CASINO? The welcome bonus will be enough to convince most players to register. But what else does Zodiac Casino have to offer? Yes, we’d like an instant play option and a few more providers ideally (notwithstanding how good that MicroGaming casino catalogue can be). However, Zodiac Casino likes to engage their players and encourage regulars to return time and time again. Once upon a time, Rewards Casino got a bit too excited about their levels of email engagement and used to drown inboxes. They are much more controlled now, but you’ll still have the chance to pick up plenty of personalised bonuses and loyalty rewards. Once you’ve downloaded that software to your phone or computer, you might just as well use it. There is nothing revolutionary about the overall casino experience beyond that incredible welcome bonus, but Zodiac Casino is a safe (with licenses from the UK Gambling Commission and Malta Gaming Authority), secure (using ssl encryption and well-supported place to spend your game time. The casino rewards loyalty program is another reason to stick with Zodiac Casino. As soon as you register with Zodiac Casino or any Zodiac casino sister sites you are enrolled in the “Casino Rewards” program. The loyalty program gives away over $50million in casino bonuses each year. You will earn VIP points which can be redeemed straight to your casino account and enjoy exclusive weekly promotions. The Zodiac Casino mobile casino is faithful to the desktop version but accessible to the browser. It’s actually a bit tidier to use as a result, and the registration process, although identical, feels a bit better. The site feels quicker to use as well, which is a bonus. Zodiac certainly encourages you to download the software, but it’s not compulsory. The mobile software has seen off some of the blockier, more dated graphics too as an added bonus. Nobody would ever deny that there are better mobile casinos out there, certainly from an aesthetic point of view. Just like the desktop site wouldn’t win any awards for its looks, the mobile site isn’t as slick as a Mr Green or LeoVegas. It works fine, however, and you can use that headline-grabbing welcome bonus on mobile games too. We find Zodiac Casino a smidgen easier to use from a smartphone or tablet than a computer. You might find yourself reaching for your mobile when you fancy a session at this casino. Zodiac Casino and its fellow Rewards Group sites have really shaken up the industry over the last few years. We imagine that the depth and sheer generosity of their welcome bonus have left many rivals scratching their head. Whether you view it as 80 shots at the jackpot or £20 free cash to play on any game, the 1st deposit bonus is unbelievably good. And that’s even before you take into account the fact that you only have to deposit £1 to get it, and it’s backed up by four more bonuses with your next four deposits. The welcome bonus deserves to grab headlines, not just in this review but in the industry as a whole. Players love it and will keep coming back for more too. Once you have the software, the site is easy to use if a little dated in design. There’s a fine (near complete) catalogue of MicroGaming slots to get your teeth into as well. Zodiac Casino has one of the largest selection of Mirogaming slots in the business. Besides slots there is also a large variety of table games and video poker games. Be the first to review and rate Zodiac Casino!